2014 HKTBA Contest Winners See more . . . Preparing for the 2013 Exhibition. See more . 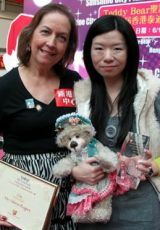 . .
2013 HKTBA Contest and winners. See more . 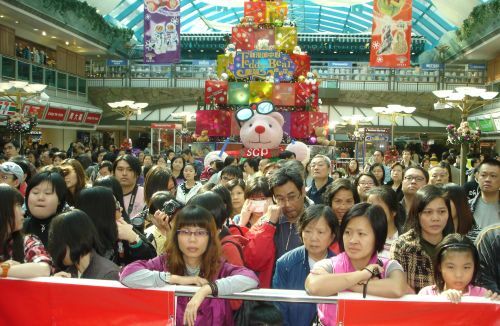 . .
Gloria asked me if I could be in Kowloon, Hong Kong on December 6th and I said "I think I could arrange that." 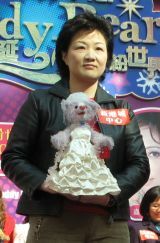 To my surprise, she invited me to be one of the judges in the 6th Annual Hong Kong Teddy Bear Association's Costumed Bear Contest. What an honor! I said "Yes, I'd love to be on the judge's panel." On Sunday December 6, 2009, Gloria met us at the train station. We were coming from Guangzhou, China, which is just Northwest of Hong Kong by about 60 miles. 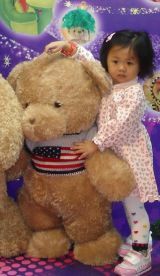 We took a taxi to her teddy bear shop and it was nearly void of teddy bears because they were at the Sunshine City Plaza for the HKTBA exhibit. 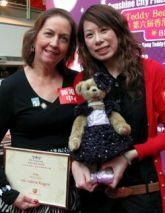 We chatted a bit about our mutual love of Teddy Bears and the accomplishments of her HKTBA members, then it was off to the Sunshine City Plaza where the awards presentation would take place. Arriving at the center of the plaza, we could see a massive exhibit and a large stage that was being set for the award's presentation. 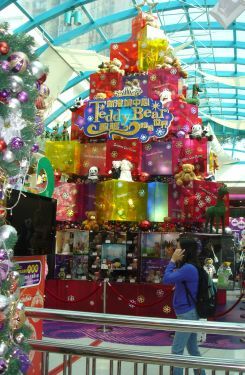 I later learned that this huge Teddy bear production cost over one million Hong Kong dollars. 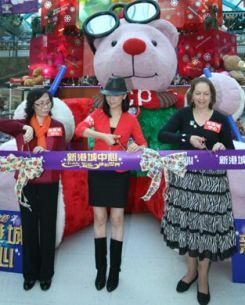 The Sunshine Plaza and Gloria were going all out to introduce Artists Teddy Bears to the patrons. The contestants started to arrive. 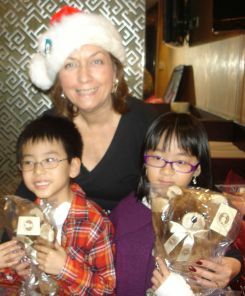 Each one was very happy that Gloria was their teddy bear teacher and showered her with compliments. 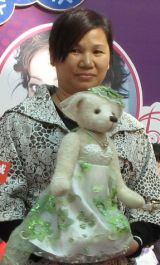 Even thought Gloria sent many photographs of the contestants bears they were more amazing in person and very detailed. See the entries. 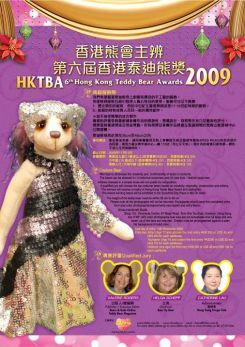 Three International judges were chosen to participate; Helga Schepp of Germany and Catherine Lau, of the Fringe Club and myself. I was fortunate to be able to attend the event. TV cameras, newspaper photographers and hundreds of spectators surrounded the fenced off stage area. 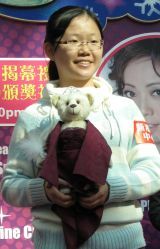 A popular Chinese TV star, Sheren Tang made an appearance on stage too. After my "on stage interview" I was asked to present the trophies. 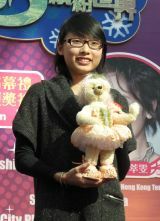 While the other contestants won one trophy Neroli, age 10, won two and was surprised that the were so heavy! Photographers seemed to be everywhere and everyone wanted a photo with 'Miss Valerie' which more than happy to smile for all the photos. 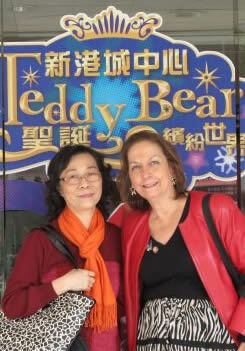 At 6:30 p.m. we walked to the Regal Kowloon Hotel for a dinner reception with the artists. 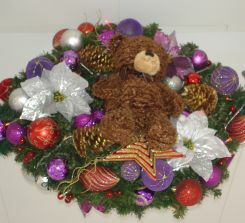 all containing teddy bears, decorations, stars and white poinsettias. 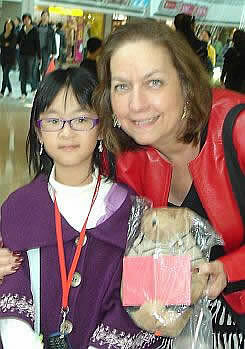 Neroli, age 10 was one of the contestants, and she presented me with a Teddy bear. She said she did not make it, but it was dressed in her school's uniform. She included a cute pop-up Teddy bear Christmas card too. 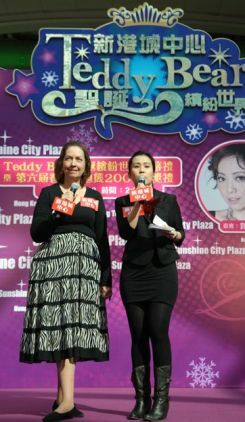 Gloria and I stood at the Plaza entrance and if you'll notice the theme is the same as she used in HKTBA 2010 calendar. A large crowd gathered for the awards presentation. 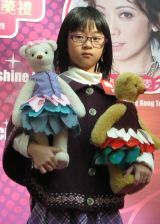 During my on-stage interview I was asked how the Hong Kong bears compared to other artists. Definitely the same high quality and workmanship I've seen from leading artists around the world. 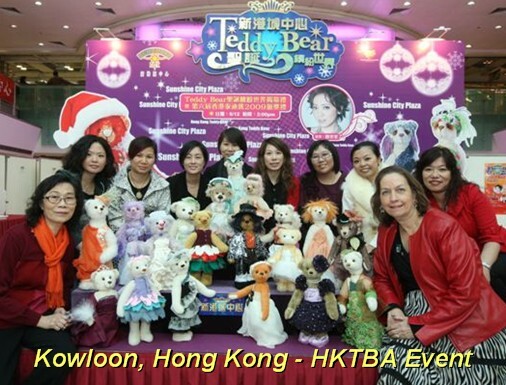 The only difference seems to be that the Hong Kong bears are all smiling! 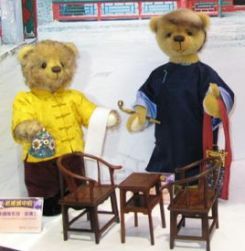 The bear makers said they wanted their bears to make people happy. 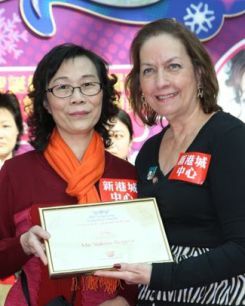 Gloria presented me with a framed certificate commemorating the event and my duties as a judge in the 6th Annual HKTBA contest. 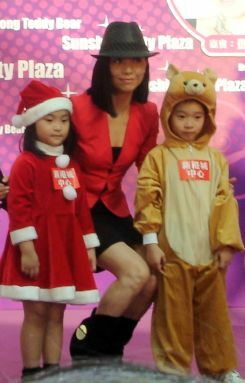 Sheren Tang, award winning TV Actress, posed with the darling young children that were dressed for the celebration. 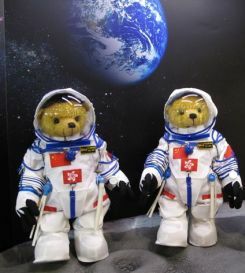 Gloria designed and made a limited edition of Chinese Astronauts which will be sold and auctioned off in the coming year. After the awards presentation Gloria, Sheren Tang and I were lead through the crowd surrounded by guards, dresses in black business suits with their hands locked together encircling us, to the area for the official ribbon cutting ceremony. We each were given a pair of scissors from a silver tray and on the count of three we all cut the opening ceremonial ribbon. Still surrounded by security we had time to see the exhibits closely. 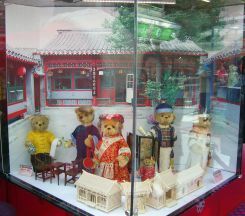 The bears were exhibited in large glass cases and many had story lines too. 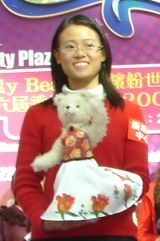 The contestants with their bears. 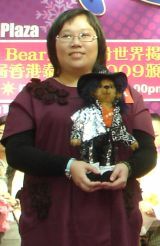 The bear was made by Lanemaria Ho, but held by Sunshine Lo who presented her. 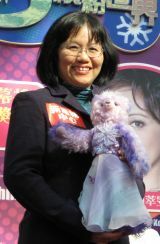 Near the end of the awards presentation, Gloria demonstrated needle felting to The TV Star and to the audience. Some of the bears were bigger than the children. 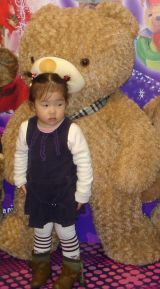 Children of all ages stood by the large bears to be photographed. 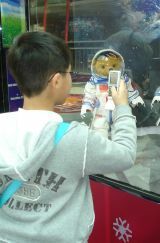 Youngsters visiting the shopping center took photos with their cell phones. Posters advertising the event were seen all around the Sunshine City Plaza. The newspapers had coverage of the event and my photo is in the picture at the top. 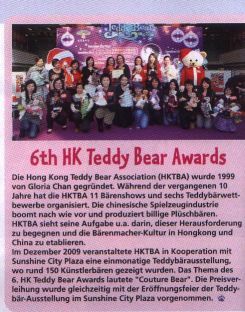 The article on the left appeared in the German Teddy Bear Magazine. Teddy Bears are truly a world attraction! 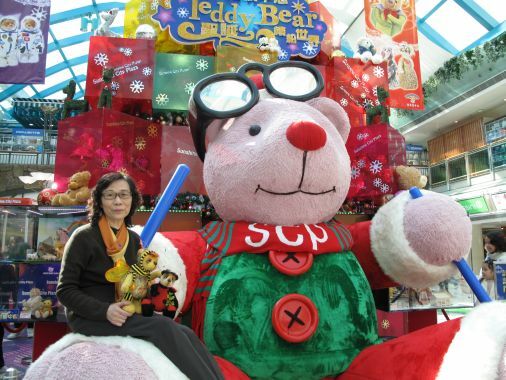 Gloria sat on the huge bear with her winning URSA Entries. Twenty four dinner guests enjoyed 12 courses of delicious food. We all were getting full after the 7th course! We ate Barbecued Suckling Pig, Stir Fried Scallops, Crispy Shrimp Rolls, Vegetables, Shark's Fin Soup, Black Mushrooms with Sea Cucumbers and Goose Feet or as they call them: Goose Webs, Crispy Chicken, Rice with shredded Chicken, Noodles with mushrooms, Red Bean Cream, and Chinese Petits-fours. And yes, I can use chopsticks well. 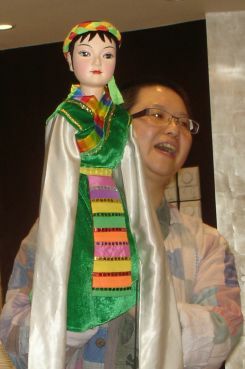 While we waited for dinner, Wing-Cam a puppeteer, showed us how the puppet works and how they entertain and tell stories. 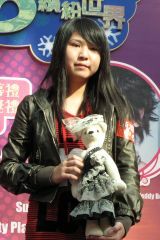 She is even was working on a teddy bear puppet. After dinner I donned a Santa hat and gave presents to each person. 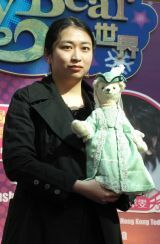 Eric and Neroli both spoke good English and I presented them GBW little bear. As you can see, Teddy bears spread joy and happiness. Thank you to all the artists, families, event producers and Gloria for a marvelous time. The day was one to remember for a life time.